Dr.Malpani's Blog: What can we do get doctors to answer patient's questions ? What can we do get doctors to answer patient's questions ? 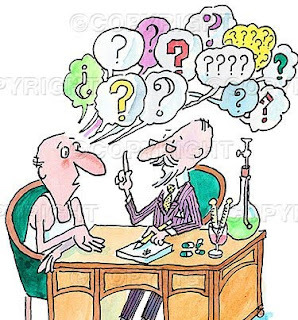 One of the commonest complaints patients have about doctors is that they don't bother to explain anything to them. Most of their explanations are short and sweet - curt and to the point. They're full of medical jargon, which means that the patient usually doesn't have a clue what the doctor meant. However, most just nod their head whenever the doctor has finished talking , so that the doctor assumes that the patient has understood everything he's told him. This brings us to the key question - if patients don't understand what the doctor is saying, then why don't patients ask doctors more questions? After all, they know it's important for them to understand what's happening to their body ! I find it quite surprising that even extremely intelligent professionals ( such as CEOs and lawyers ) are often tongue tied when talking to a doctor. It's not as if they don't have any questions, or that all their questions have been answered - it's that they are often scared to ask them. Part of this is because they feel that the doctor is very busy, and they don't want to eat into his time - after all, he has lots of other patients to see. However , a lot of this is because of the doctor's body language. Patients are very aware of the doctor's non-verbal signals, and they can sense that the doctor may not take kindly to being grilled further. It's pretty obvious when the doctor signals that he's said everything he wants to say, and that more questions are not welcome. He wants the patient to move on, so he can move on to seeing his next patient. Doctors are in a hurry to terminate the consultation , and most doctors prefer compliant patients , who are happy to do whatever he says . Doctors don't like patients who pester them with lots of questions, and they make their unhappiness very clear. Also, patients are worried that the doctor may think they are stupid if they ask very basic questions, which is why they bottle them up. Some go to Dr Google to try to find answers, but this means that they often get confused or lost , because they cannot assess the credibility of websites. This causes even more frustrating, and this is why patients complain about their doctors' inability to communicate, especially when things go wrong. The fact of the matter is that doctor patient communication is a two way street. Patients also need to learn to speak up, rather than leave everything up to the doctor. After all, their doctor can't read their mind, and if the patient says they don't have any other questions, what's the doctor supposed to conclude? Patients need to remember that the only stupid question is the one they don't ask ! Yes, it's true that the locus of power lies with the doctor, and that there is a lot of information asymmetry. The patient feels vulnerable, and is scared to ask questions because he doesn't want to upset the doctor. He's worried that the doctor may get irritated if he asks too many questions, and therefore he thinks it is safer to keep quiet. However, if a doctor feels that he's done a good job with communicating with the patient simply because doesn't ask any questions, then he's just fooling himself. The truth is that silence does not doesn't mean that the patient has understood everything you've said ! Doctors need to be far more proactive in encouraging questions from the patient. Many doctors are scared that this will consume a lot of their time , but it's far better to clear the patient's doubts rather than let them fester. These shortcuts will come back to haunt you later if anything goes wrong, which means that your impression that you have saved time by not answering their questions is completely illusory. Tragically, today it's usually only the doctor who is the one asking questions during the consultation! We need to flip this around. The good news is that a lot of patient education can be done digitally - both before the consultation; in the clinic; and after the patient has gone home. This is what will actually save the doctor time - and also ensure that the patient has understood everything the doctor has told him.